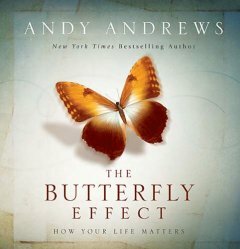 I had the pleasure of reviewing another book by Andy Andrews called "The Butterfly Effect." I am grateful for Thomas Nelson's Booksneeze program -- bloggers like myself get opportunities to get nourished by today's brilliant Christian authors and thought leaders. My husband and I are active in ministry. I frequently engage with people (mostly women my age) who feel like their life has little impact on anyone or anything. The book is terrific for both big readers like myself and for those who barely have little time to sit down. It can be read in fifteen minutes. The short reading time does not mean the impact of the content is compromised. The book talks about the following questions. How significant is my life? ... does the universe notice? Let me tell you about amazing people whose actions made an impact on my life today. They have probably wrestled with the questions above and hope that the following statements give a clear answer. 1) In sixth grade, I had an English teacher who made me write essays all the time. I had a couple of ones that were read in front of the class. 2) From the time I was ten years old until I was twelve, I was part of a church choir. Our music teacher rehearsed us after school every day and asked us to sing in church every Sunday. 3) My mother taught me how to read at 3 years old. I clearly remember the little chalkboard we had in our home and being coached on how to properly pronounce each letter. 4) In my junior year in high school, I had a teacher who personally coached me on grammar and linguistics and stayed in touch with me even after the school year. We are still connected to this day. 5) When I was a freshman in college, I had a close girlfriend who loved Jesus. At that time, I loved her but I couldn't imagine living the "clean" life that she had. She expressed how brokenhearted she was when she saw me light a cigarette. But she never ceased to pray for me and was there for me on days I hit rock bottom. It's almost crazy to think I how I have evolved since that time. "The Butterfly Effect" shares specific stories on how seemingly tiny gestures of kindness dramatically affects someone's life and perhaps, even the entire universe. All of us does something that matters. We all have been created by our Father for a purpose that will make a difference. We all have a God-given power to change the world. If you need a heartfelt reminder of this fact, I strongly recommend that you spare 15 minutes of your time today and read this book.